Last week, I made one of those freak miscalculations that left me stranded in Leeds Station fairly early in the morning with nothing to do. My train left at 10am, so I had an hour to wander around and explore the parts of the city south of the River Aire around Holbeck. Breakfast seemed like a good idea, and a touch of twittering later, I was heading towards The Engine House Cafe. Twitter is a very strange thing, and I’ve fallen for it completely – there’s a world of people out there who can answer simple questions like ‘Breakfast. Near Leeds Central. Where? GO!’ within seconds. It astonishes me that such generous and well-informed advice can come hurtling through the interwebs, straight to my phone, with such ease and fluency. To those who say they don’t get twitter, well, your loss. It seems that there’s a lot of people in Leeds who are passionate about both twitter and a decent breakfast. It would seem that if you’ve got an hour to spare within a ten minute radius of the station, you’ll breakfast like a king. Somebody had commented earlier that a full English breakfast “requires proper atmos for full enjoyment. Smoking crack in a clean loo just isn’t the same” *. Apart from it being a great line, there’s a lot of truth truth in it, so I was a little nervous about choosing The Engine House from the dozen or so recommendations I’d managed to gather. The Engine House Cafe is part of the Round Foundry development, just off Water Lane and right in the middle of Leeds’ booming creative and media area. It’s in the shadow of the equally loved and hated Bridgewater Place, or The Dalek to the locals, and just round the corner from the Cross Keys and Midnight Bell. There’s the stripped back to the brick aesthetic you’d expect in a mill conversion like this, and it gives the cafe an open and relaxed feel. It was quiet, just me, a paper and another table of businessmen, but it was still early and plenty of people dropped in for takeaway sandwiches and coffee. Full English breakfast, then. Seemed rude not to, really. So, The Engine House is no greasy spoon, nor does it try to be, but it excels in other ways. Offering a proper breakfast menu and very good coffee is an obvious place to start. 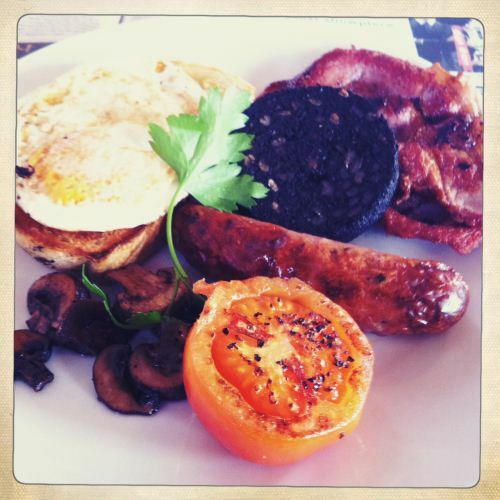 My food was great – everything you’d expect, complete with a thick slice of black pudding, a good sausage and bacon crisped just slightly too much, which is of course, how it should be. That garnish of parsley was unnecessary, but at least it was Italian flat-leaf, and it shows that presentation is important to the cook, which in turn gives a big hint that his food is likely to be good, which it most definitely is. The Engine House is open for lunch, and has a strong reputation for it’s evening menu. It’s worth another visit, I’d think. *If you’re looking for examples of other such nuggets, @_jonb is a good place to start. Never been for dinner, but breakfast here is great, and its nice to be able to sit outside away from the traffic, even if the view is spoiled by that awful Dalek building! I went for dinner here ages ago – I think it was quite newly opened as we were snapped by a photographer for the review in the Metro (woohoo for glamour!) and I remember thinking it above average (although I didn't blog about it … odd). So it's nice to know it's still open (& I certainly could have done with knowing about breakfast on those times my train to London was cancelled/delayed!). Out of interest, what others were recommended that were more central? I was recently trying to think of somehwere but drew a complete blank. All the options I could think of were either too expensive (j'accuse! Harvey Nicks) or the usual catering sausage/watery bacon type. Fair enough, maybe that's all I should expect for a fiver but I don't see why – the Engine House seem to be able to manage it. …La Strega, The Restaurant Bar & Grill, David Street Cafe, Out of the Woods, The Pickled Pepper, Riveresque, and Wetherspoons in the Station, but I strongly suspect that last one was merely a ruse. I've never even heard of this place, sounds great and not too expensive either! I had dinner here last Saturday and it was great. Lovely burger – mince and pork!- and great value. The breakfasts were on the chalk board next to the bar and looked like a good choice. WIll have to do it some day!